2-CD with 24-page booklet, 19 single titles. Playing time approx. 127 minutes. The layman is astonished and the expert is surprised: hardly that the Germans had lost the World War they had instigated, they sharpened their lips again to sing a well-known Landser song:'Who wants to be among the soldiers? That was in the mid-fifties. When East and West fought their Cold War, the Germans were needed again. Now the Wehrmacht was recently called Bundeswehr. 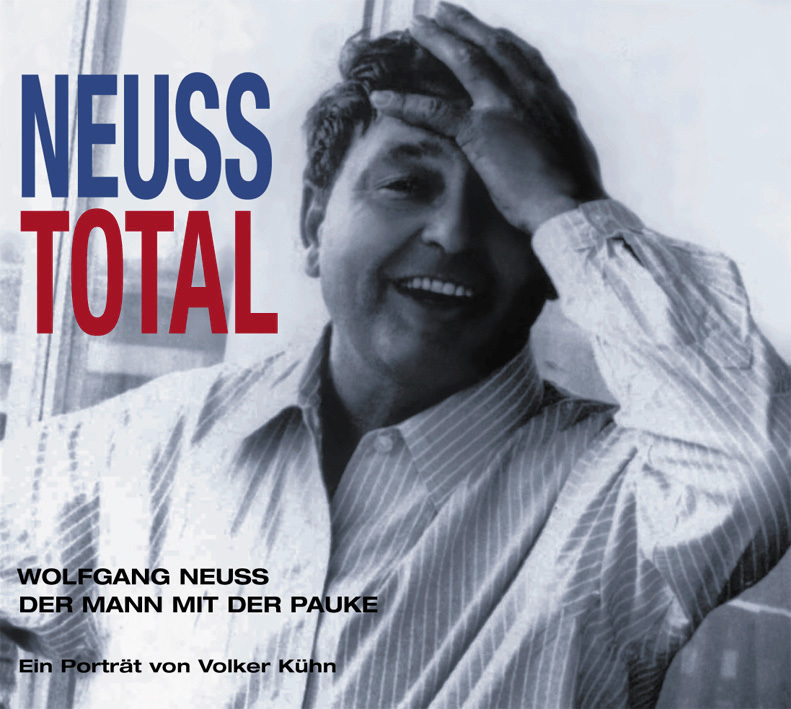 Wolfgang Neuss, Berlin's undisputed cabaret star no. 1 in these years, known from film, radio, stage and television, took up this explosive topic. And that twice. In his story'Two Berliners in Paris' two old front pigs, who had already lain in Russia's vastness in the mud, again set out for France and have all kinds of aha and déjà vu experiences there. And in the'Serenade for Scaredy-cat', military violinist Schüttepo, who had already fiddled the withdrawal of German troops from the Eastern Front, hopes that his musical tricks will also be in demand at NATO. Two cabaret variations on a theme that has recently regained topicality. Both recordings feature a replay with Wolfgang Neuss, the unforgotten jack-of-all-trades of the German cabaret scene. Furthermore, Neuss buddy Wolfgang Gruner from Berlin'Porcupines', Katrin Schaake, Heinz Holl and the Johannes Rediske Quartet are part of the band. These cabaret highlights slumbered in the archives for more than forty years. Now they can finally be heard again. On a double CD from Bear-Family Records. 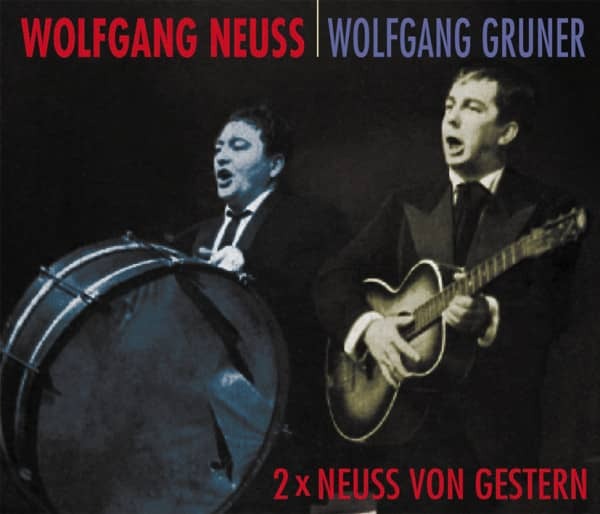 2 x NEUSS VON GESTERN Twice Neuss from yesterday - when yesterday was still today, this Neuss is the big number. 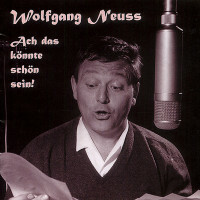 A comedic jack of all trades, a cabaret all-rounder, known from film, radio, vinyl, cabaret cellar, theater stage and television, omnipotent and boastful everywhere, fresh, cheeky, cheerful, free, one who carries his heart left in the right spot and is always ahead with his notorious muzzle: Wolfgang Neuss. His talent to look the people in the mouth, to speak his language, to think his thoughts and to formulate what the little man around the corner could have formulated if he had been able to make all this quickly known to Neuss as'man with the timpani'. The more than fifty feature films, in which he was to be seen mostly, as before in the cabaret, as a duo partner of Wolfgang Müller, soon made him popular. And they loved this banger from next door, they celebrated him when he gave tens of thousands of'them up there' tinder in front of the Berlin Waldbühne, they felt with him, when he was as cunning as he was funny, as cunning, as sly as he was embarrassed, as aggressive as he was warm, as naive as he was cunning, and a coward with civil courage, a roughneck with shame mouth and butcher's charm beat around him. 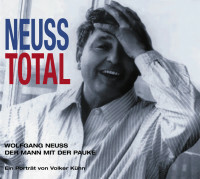 Later, in the sixties, he held it with the rebellious students, took them out into the streets, mutated from jester to political clown, shot his own films, pushed from cabaret to satire with a daily political orientation and set standards with his three one-man shows'Das jüngste Rum Rum Rumcht','Neuss Testament' and'Asyl im Domizil'. Soon the Berlin-born cabaret artist from Breslau was the number one, Germany's sharpest and at the same time most popular satirist among the fun-makers. Wolfgang Neussspielt played Shakespeare and musicals, appeared in boulevard-clothing on stage and in Peter Weiss''Viet Nam Discourse'. He thought up Brandt's Ostpolitik, devised slogans like'Pack den Willy in den Tank', drummed for the SPD, campaigned for the extra-parliamentary opposition and was promptly expelled from the party. He betrayed TV murderers, was always good for a scandal and only really came to life when the mighty headwind of the powerful blew against him. He founded a satirical magazine called'Neuss Deutschland', which was anything but a harmless piece of humour to laugh at. The'organ of the Central Comedy Team of the Satirical Unity Party of Germany' carried Charlie Chaplin in the coat of arms and loudly demanded the categorical-cabaret imperative:'Comedians of all countries, unite' His sharp-tongued punch lines were feared. When Wolfgang Neussdann had to realize that the jokes on the street and on the smooth floor of the professional politicians are made that the cabaret punch line in the cabaret cellar does not effect any change, he gave up. After what had to be said was said, he lived the protest that he had shouted out long enough for the pleasure of his clientele. He withdrew into his own four walls, which did not belong to him, wore the long hair open, set his whistle on fire, became a drug guru and from then on let it be enough. With the same determination, tenacity and perseverance with which he had previously pursued his ascent, in the seventies and eighties, cowering at home on the worn mattress, he carried out his last solo program on his own: How do I become unknown again? Nevertheless, he continued to make jokes, puns and razor-sharp punch lines. But now he told the jokes to himself or to a small circle of close friends who still stood by him when the top earner had long since become a social case. A joker who was bitterly serious about himself, about cabaret, about life. Because he wanted it that way and no different. Customer evaluation for "Zweimal Neuss von Gestern (2-CD)"